we've had in over 100 countries for your project. 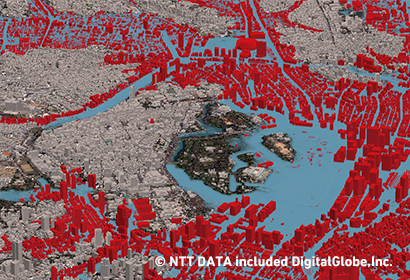 The possibilities for 3D maps are infinite, ranging from wireless planning, city planning, infrastructure management, disaster management, environment monitoring, to applications in public health. With the advancement in technology, progress has been made in driving forward the demand for 3D maps in almost every aspect of our lives. AW3D has successfully established a highly capable ecosystem to provide a rich line up of 3D maps with cost effectiveness, consistence and fast turnaround time to more and more people. Whenever your project needs a force to move forward, AW3D is the answer. AW3D has been supporting network planners in telecom and IoT industries. 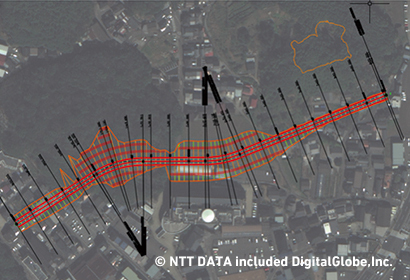 Highly accurate and detailed 3D digital maps are crucial for designing especially 5G networks, which would use millimeter-spectrum waves that are highly sensitive to interference from natural and manmade objects. Our cutting edge technologies enable the capture of detailed objects to build advanced datasets for highly precise 5G planning. It is expected to be used by telecom carriers, network vendors and IoT companies engaged in businesses involving 5G networks." Highly reliable map with uniform and guaranteed quality is an indispensable element in modern society. However, "map" is defined differently from one country to another, in regard to each law and regulation. For such reason, collecting a worldwide map with uniform quality and reliable standard is not the easiest mission for any professionals. 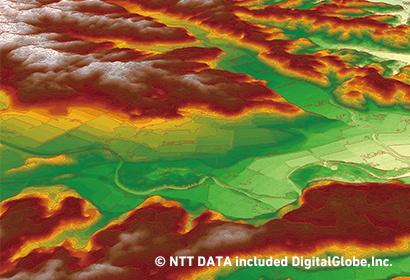 AW3D is a 3D map generated from satellite imagery, with uniform quality over the very wide area, and proven to be suitable for many map requirements with the scale between 1:25,000 and 1:2,500. In recent years, a natural disaster occurs more frequently than ever, resulting in higher needs for sophisticated disaster management. Disaster management is also evolving along with technology, with more demand for three-dimensional disaster information rather than old fashioned two-dimensional data. 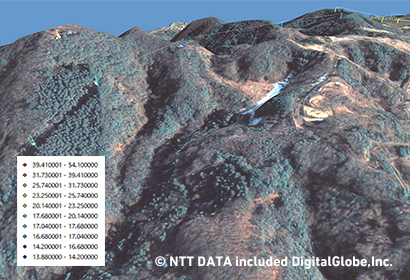 AW3D offers highly accurate terrain data and man-made objects information, make it possible to precisely simulate many kinds of disasters such as a landslide, flood, and building collapse. More importantly, these simulations can be conducted before any disaster even occurred, make developing any emergency response plan will become easier than ever. In the event of major natural disaster, satellite imagery of the aftermath will be available in very high frequency, making it possible to detect disaster-affected areas and build a disaster recovery plan in a very responsive manner. 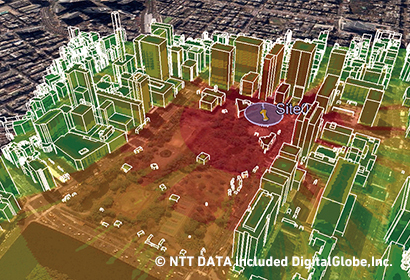 As any AW3D data is generated from satellite imagery, none of the no-fly-zones restriction will affect the data collection capability, make it one of the most reliable data source for wide-area disaster management. Thanks to this characteristic, AW3D has been deployed as one of the data sources in many disaster management projects around the globe. Digitalization in the construction industry has been speeding up in recent years, in an effort to improve efficiency in a construction project. High-resolution and high-accuracy site survey is a key for a successful construction project, but it usually needs overwhelmingly high cost and long timeline to complete, especially in large infrastructure project covering a very large area. AW3D data is based on satellite, which minimizes the importance of on-site survey in the initial phase of a construction project, and can cover a very wide area without having to worry about flight restriction zone, yet highly accurate that its accuracy can compete with the aerial survey. AW3D is highly suitable for large infrastructure projects such as road and rail construction, city planning, green area management, dam construction, and river development. It is also compatible with major GIS software and CAD platforms, make it a ready-use data for any construction projects that require more efficiency and shorter timeline. For efficient mining and exploration of natural resources, an extensive and accurate exploration site survey is required. However, a pre-exploration on-site survey could be very costly, time-consuming, and sometimes dangerous. AW3D is useful to get the whole picture of exploration site without the needs of the on-site survey, in lower cost and shorter timeline, but without a single risk for even the most dangerous place on Earth. AW3D is highly rated not only for its good accuracy in both vertical and horizontal directions but also for its great compatibility with non-visible bands of satellite data such as short-wave infrared (SWIR). With these characteristics, using AW3D is regarded as an efficient way to manage and operate any natural resources exploration, including oil, gas, iron, and gold, not only to understand the current situation but also for learning past condition. A electric power system, such as power plant and power grid, covers a very large area, and sometimes its coverage can be country-wide. Surveying the whole area by a traditional method would take a very long time and the cost would be very high. AW3D has been used in many dam construction projects and proven to be useful for soil volume calculation, initial design phase, and river slope analysis. It has also been used for power grid planning and management, such as power line route planning and power tower management, thanks to its low-cost characteristic and supreme coverage. Self-driving technology is undoubtedly the future of road transportation, with many companies and governments investing heavily on its development and deployment. As part of an autonomous car system, a high-accuracy 3D map is considered as an indispensable core element of it. 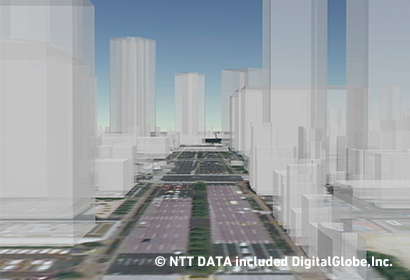 However, there still less than 1% of the entire globe road network's high-accuracy 3D map is available to the day, and to prepare the remaining 3D map as soon as possible is more important than ever. AW3D combines image-processing technology and artificial intelligence (AI), along with its cutting edge 3D mapping capability to extract as many information as possible from spaces, including road lane, line markings, slope information, and object height. All of the processes are done automatically to develop a base map for the self-driving system in a highly efficient manner, with low cost and short timeline, yet in uniform quality to support autonomous car implementation as early as possible. In managing national security, any kind of required information needs to be collected precisely, yet effectively to make sure any decision making can be done accurately in a short period. Among those, geospatial information is one of the most important information to consider, but usually difficult to collect effectively and precisely, especially for a country-wide scale. 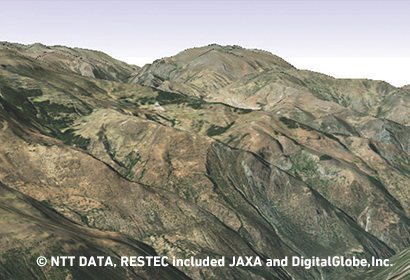 AW3D offers both 2D and 3D geospatial data, with high-resolution and high-accuracy, while able to cover a very wide area in shorter turnaround. 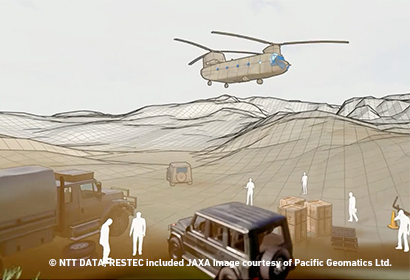 Thanks to its capability, AW3D is proven useful as a foundation of any geospatial information in supporting decision making of national security matter.